In the genre of spirituality this book ranks only behind Thomas Merton. 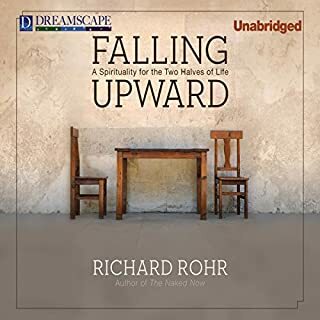 Rohr clearly has found guidance and deep inspiration from Merton. If you've read Merton, you know this is a very good thing indeed. The key to our happiness is contemplation and finding our true selves. This book will reveal that in an easy to follow manner. This book made me want to work harder toward a mindset of contemplation. I found myself rewinding and bookmarking more than any other audio book I have purchased. Once I stopped listening for the day, I wanted to sit and write my own thoughts and ideas about how I could apply these principles in my life. I do recommend that you don't try to "finish" this one quickly. Take your time and listen in 30-60 minute sections. Allowing yourself the time to contemplate and soak in the message. One word of caution, you have to be open minded and ready to hear this message. If you can allow yourself to begin this process it will change everything. However, in our world today we are so "tribal" that we are not used to thinking this way. We identify so strongly by political party, religious denomination, and class - that seeing the world as all of God's creation isn't nearly as easy as we think. At least it wasn't for me (once I really analyzed myself) and I consider myself open minded. Once you "get it" the concept seems simple and essential to happiness. But everything around us tells us to think differently. A major concept of the book is to change our "either/or" view of the world to a "both/and" mentality. This is true wisdom. The older we get (I am 42) the more we realize there are no simple answers to our problems. But don't think that Rohr bashes our youthful certainty and fervor. He does no such thing. He calls on the importance of parents to instill impulse control, rules, and structure for their children. He calls this early way of thinking: "building our container". So that once we reach maturity we can properly hold and understand what is really inside. Far too often we worship the containers in life: religious practice, strict adherence to rules, and high expectations. This book will teach you how to respect the containers while fundamentally changing how you view what is inside - your soul.